Cool as ice. The Queen of Cups is the Snow Queen. Infinitely lovely, gracious, kind and generous, she is completely aware of who she is at all times. She is in control of every situation, and every emotion. You cannot touch her. You may connect with her, but only on whatever level she deigns to allow. 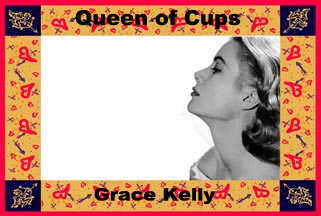 Icy Grace was snapped away from the The Grace Kelly and Princess Grace of Monaco Page.